Throughout the day on Wednesday, the January transfer window was being slowly pushed downwards until, at midnight, it was lowered all the way, finally making contact with the window sill and, with a firm turn of the wrist, latched shut. With no way to get in or out, the small flurry of player transactions carried out by Barça over the previous thirty days had come to a sudden end. 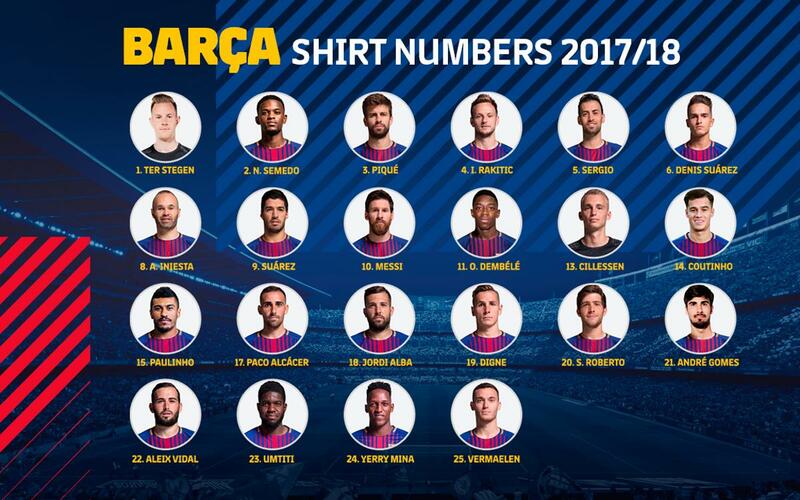 Already inside the house, the Brazilian midfielder Philippe Coutinho and the Colombian defender Yerry Mina had chosen the bright, bold golden numerals they will sport on their blaugrana plumage — 14 for Coutinho and 24 for Mina. Just days earlier, 14 had been jettisoned by Javier Mascherano, the Argentinian midfielder who departed through the very same window — due east, headed for China. Arda Turan and Rafinha, too, have flown east — Turan to his native Turkey and Rafinha to Italy. Gerard Deulofeu, however, has gone northwards, and has landed in England. Those three exits have left the numbers 7, 12, and 16 unclaimed. Now, with the team set for the remainder of the season, see which players will be sporting which numbers up and down the roster.